I have learned that you do not mess with the sea. Ever since being caught in a rip tide and rendered helpless several years ago, I realized then, the power of nature. It makes the decisions. We don’t have a say. And yet when my assistant and I awoke to howling winds and whitecaps stirring up the sea in front of our hotel and noticed that there was no 7am ferry docking, nor passengers waiting to leave, we hurried down to the front desk to ask the manager what was happening. “You’re kidding,” I said, more than upset that seven retreaters had still not arrived and all of our best-laid plans for opening day would be trashed. Instead of going to Plan B (of which there was none), I instead chose not to believe him, a not so subtle arrogance rising within me. I deemed that the storm would pass over and surely, the powers to be would reinstate the ferry service later in the day. After all, I had been coming to Iona for years and have never experienced such a thing! What’s more, looking out the window, all appeared normal. The sun had crested over the moors of Mull right on schedule, gulls were happily honking, and a family of unperturbed sheep had just crossed the hotel’s small front lawn to graze on a patch of lush grass. We sat down and ordered coffee, staring at one another in disbelief. “They say the best laid plans always change,” said a young waitress attempting to assuage our angst. I looked at my assistant, shaking my head and wondering how we could adjust our perfect agenda. “That’s the problem,” she said, “we were into perfection.” Indeed that is the problem with most endeavors that women get involved in. Be it a family wedding, decorating a children’s bedroom, planning a dinner party, doing Christmas—we always think Hallmark and attempt to make it memorable, if not perfect. I recall planning my first son’s wedding on a budget and having my fingers in every pot to make sure (regardless of lack of funds) that it be perfect. Alas, after the grand occasion, I was a mess—so involved in every detail I could barely remember the overall event. Remorseful and disappointed, I tearfully confessed my feelings to a friend. She loaned me a book entitled, Addicted to Perfection, and from that day forward I became less the leader and more the participant. “I am not what happened to me,” said philosopher James Hollis. “I am that which I chose to become.” Acceptance of what IS made us all the more eager for what could be or what was to be. Surrender doesn’t mean quitting, rather it means giving in to circumstances and then standing back and letting the situation unfold. Imposing our ways and thoughts often misdirect the other. At the very least, when we try to play God or choreograph a particular scene to fit our viewpoint it becomes something willed instead of something that needs to evolve. Take this week and step back from confrontation, directing, fixing, offering suggestions and record how that makes you feel. It may be the greatest gift you can give yourself. In any case, for just this week, you will be off the hook. I have taken the week, the last in the semester to let go of trying to help every student, especially the ones who have waited until now to turn in past assignements, lesson plans, etc. I simply took back my time. I ended the academic week taking care of each last lecture, class activity, performance and said no those who are past due on their class work. It felt good to just take care of my time and myself. I had to let go of the urge, nurturing and feelings to fix it so they will give me good evaluations. I held my ground and I do feel better. I can and Iwill! Waiting. Perfection. Expectations. Need to be Control. Yes, these have all been struggles in my life. I now try to breathe in Letting go and Acceptance and remind myself I’m not in control and that all is well. Today I am packing up decorations, back into their boxes they go, too distracting, too time consuming for me to tend. A new peace is settling in. A new energy and I KNOW this retreat is having a profound impact. I am reading the Iona comments with great interest. I had so many discombobulating moments on my Cape Cod retreat when things did not go as planned. At 48. I just didn’t get it yet. Now I feel a genuine shift. Over the weekend I had a lovely conversation with my son who has discovered that the spiritual philosophy that speaks to him is Taoism. How invigorating to consider new spiritual ideas that fit so well with all we have shared. I am grateful for all the clarity that is clicking into place. Letting go is a great Plan B! Why struggle when so many lessons are there to be noticed. I’ve read all of your books; some twice. What a surprise when I discovered your On-Line Retreat! I’ve had to deal with some difficult transitions over the past few years, so your reflections and the comments of others have provided an enormous amount of food for thought! Thank you for starting this On-Line Retreat! I have been following the online retreat with interest, always plenty to think about. Surrender to serendipity seems a very good motto, be present to all that could be. All the energy spent on trying to control, life could be much more peaceful if surrender was practiced every day. After often being drawn into disagreements with a relative I read “Give up being right” Deepak Chopra (again). I try to practice stepping back, (sometimes it is harder than others) it’s just your view, you may not always be right to another person , but my focus is to keep on trying. What does it matter in the scheme of things who’s right, if in trivial victory you’ve alienated your family. So here’s to the practice of surrender and peace, thanks Joan for the reminder. Oh, how I am loving your online retreat, don’t always comment here, but, have many comments in my head. I have only recently began to use plan “B” in my life, it was ALWAYS plan A that just HAD to work out, well, guess what, 90% of the time it did not! I am saving my sanity by giving up on this perfection thing that I always seem to strive for. or Indian Chiefs! Sometimes,not even my husband! I shall keep “plodding” along, thankful to read your posts always. 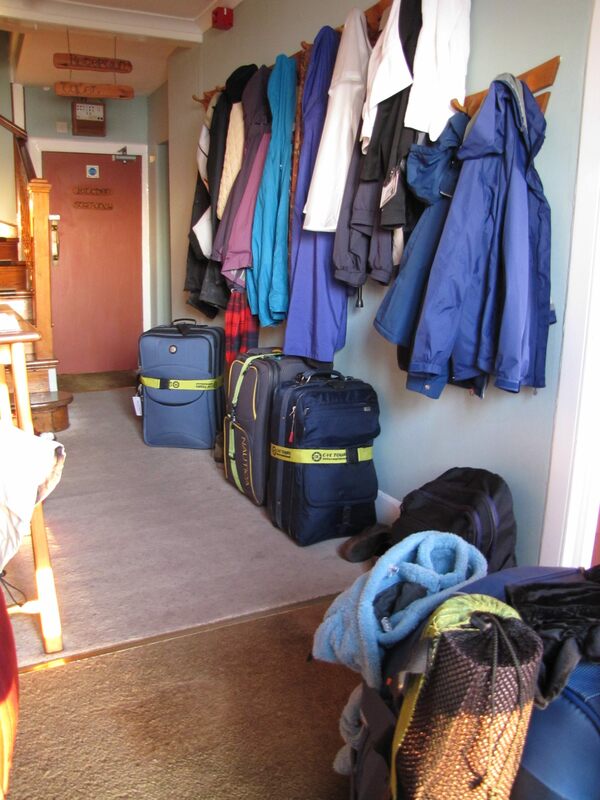 As one of the 7 stranded on Mull, today’s posting brought back a flood of memories! As odd as it might sound in our day of waiting at the dock….so near and yet so far from Iona…there was a certain peace in the waiting. 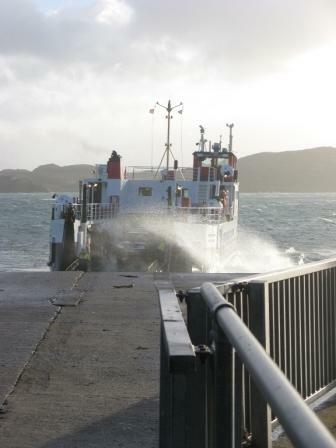 Even as we set out on the ferry, touched the landing point, could not get off due to the roughness and retreated back to Mull a feeling for the forces bigger than myself seemed to keep my frustration and impatience at bay. For whatever reason (maybe my trip the year before to Iona?) I was content to go with whatever happened and did not feel frantic….disappointed yes, frantic no. Of course the fact that there were 6 others with me all yearning for Iona and all unable to get there might have helped! 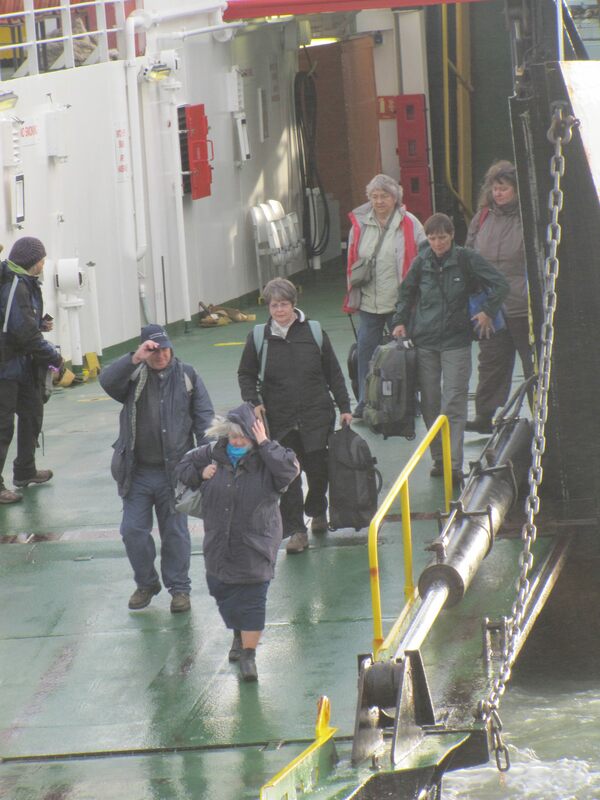 Never has there been a sight as glorious as the ferry loading the next day and LANDING on Iona to be greeted by our fellow retreaters with open arms and hearts. Hi Joan, When I read this entry I had to go and pull out my Iona journal. You may recall how I missed the ferry from Oban to Mull resulting in missing the bus to the other side of Mull, getting a car ride from the father of the gift shop clerk, hence getting to Iona as everyone was gathering out front of the Argyll ready for the first walk. I was frantically waving my arms from the ferry as I saw the gathering. I ran off that ferry and moved as fast as my legs could go to get to the Argyll and yell “wait!” When the schedule went awry, I lost it..all the planning, the monies, taking care of things at home, my classroom plans for my sub, and all that went into getting to Iona fell into a streams of tears at the gift shop in Craignure. I let it all go during the 90 minute car ride listening to my driver tell me all about the island’s trivia, stopping at his wife’s school during lunchtime, waiting for sheep to cross the curvy road, all knowing that this farmer cleaned his car out for me, got freshened up and pulled up to the ferry as it was loading passengers. When the Abbey came into my viewpoint for the first time, all of it was worth it. Later, the unexpected happened on our first walk. I was by the Abbey when a woman stopped to say hello and catch her breath. She had been coming to Iona for many years (her daughter is buried there) told me this: “You must let this place be magic for you; you must let it happen. It does not matter if you are seeking or if you are not..you will find it in time…” If we only surrender to such advice and listen and listen deeply. Sometimes it finds us instead in unexpected places and times…and that often is “plan B”.